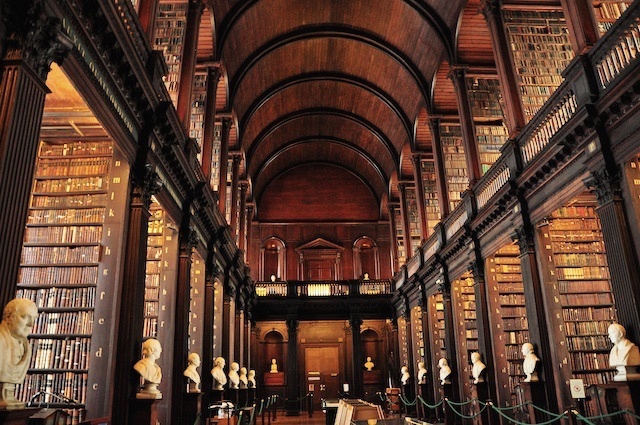 Last summer Chant and I visited Ireland for what I hope is going to be the first of many trips. The landscape of soft rolling hills seems to whisper a lullaby that can ease you to sleep… until the horn of a city bus snaps your attention back to look in the right direction before stepping off a curb. 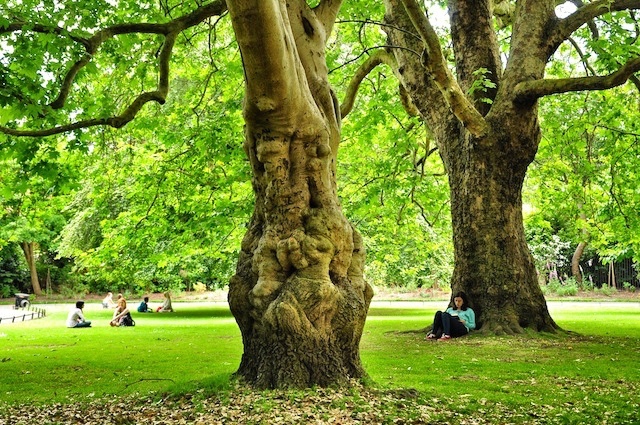 One park in Dublin had beautiful London Plane trees – like sentinels from fairy tales. There were people scattered across the green landscape, reading books and engaging in intimate conversation. I couldn’t help but wonder how the surrounding physical landscape influences how the stories resonate with the readers. This thought process made me think of Trinity Bellwoods Library, not far from this park, and the collection of books and stories that is housed there. I’m inspired by the juxta-positioning of these images: one evoking freedom and soft cyclical sensory stimulation; the other quite linear, composed and intentionally compiled. For the most part, I feel like it’s the time during these travels that is most absent in the bustle of the day to day. Time to simply think, ponder, contemplate, reflect, and let your mind wander into its own recesses on topics, issues and memories that you may not normally entertain. I’m writing this as I sit on a train traveling from Toronto to Montreal, with Chant next to me, and I realize that after years of journeying and living in other cities, I appreciate that it’s the people and the human connections who impact the small moments that forever mark and make our lives meaningful. These are the voices that make up our histories and our emotional intelligence. Learning and sharing various and diverse stories about assemblages, networks and flows inspire us to action and to make better choices. Our physical environment, that which with we are surrounded (by choice or not) is an active participant in this process. While I spend this autumn traveling across Canada – to Halifax, Winnipeg, Toronto, Montreal and Vancouver – to deliver the Canadian Urban Forest Network workshops with Tree Canada, I’m looking forward to meeting dedicated people and making new acquaintances that share my vocation for urban forests and the stories they inhabit.